What the Experts are Saying. 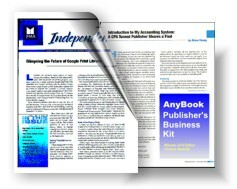 . .
AnyBook was featured by the Independent Book Publishers Association. It was reviewed by Diane Tinney, a CPA and the author of several computer books. "I downloaded your software and it is incredible. There's nothing like it I've ever seen. I am mentioning it in the next newsletter!" --TomPerson, a long-time publisher and editor of a newsletter for small presses. "AnyBook is easy and powerful, and yet the advanced features don't get in the way of novice just trying to get work done." the author of several computer books and owner of Keene Publishing. Carefully crafted and well tested, AnyBook is the winner of a number of shareware awards and is highly regarded in the publishing and software worlds. Designed for medium, small and self-publishers, it generates invoices and billing statements, keeps track of inventory, handles book returns, produces sales reports, records customer payments, tracks consignment items, and creates mailing lists. AnyBook is a shareware program. That means it's free to try out. Give it a good test drive and see if it will work for you. It has a comprehensive, highly illustrated help system (over 1,600 pages) - and since we use it extensively, we know it works well, and it gets the job done. We are certain that you'll find it just the sort of thing that you've been waiting for: easy to understand, easy to use, and designed just for publishing. The AnyBook Professional Series - Available in Seven Levels . . . The AnyBook Professional Series is the result of years of research and development and is made up of the premier versions of AnyBook. This is state of the art business software. The Professional Series consists of seven levels: Levels 1 through 7. Each higher level provides more options and a larger range of features. All Levels are compatible. You can move from Level 1 to Level 2, or Level 3 to Level 4, or even from Level 1 to Level 7. AnyBook's built in compatibility provides you with the assurance that as your company grows, AnyBook can grow with you. You can upgrade from one version to another and not lose valuable customer data that you've built up over the years. The Professional Level 2 Edition includes all of the invoicing features found in Level 1 plus two huge additions: a billing generator and inventory engine. Both are so comprehensive that they could be sold as complete programs by themselves, but, rather, they are integrated into AnyBook's overall structure. Level 2 includes more than just the billing and inventory engines. It includes back order processing; the ability to add logos and other graphics to printed invoices and statement; payment and deposit reports; a counting feature which provides helpful information such as how many invoices have been issued to a specified customer, how many of a particular product, how many invoices are unpaid, etc. ; advanced searching which allows you to find any piece of data among your business records; find and replace; an export feature for exporting sales, credit card, or invoice data to other programs, and many other enhancements and time saving features. More Details. Works on Most Computers. The program works under the following operating systems: Windows XP, Vista and Windows 7, 8 or 10. (32 & 64 bit). For more information, see System Requirements. "Accessible menu items and clear layouts ease the learning curve, as does comprehensive help and specific topics for getting started." AnyBook Download - Select the desired download, below. As you run the program, the features of each level are plainly marked in the menus. This enables you to try out a range of levels and decide which one will work best for your business. If you're a current AnyBook user & want to update your program, use the appropriate link above. Need Help on Download and Installing? See: downloading & installing AnyBook. For your safety, all files have been extensively checked with McAfee anti-virus software and independently re-checked and tested by independent contractors. For more information, see program and Internet safeguards. If you've never downloaded a file before, here's a step-by-step procedure: downloading & installing AnyBook. AnyBook's distribution files are placed in a self extracting zip file. Self extracting zip files make software installation quite easy. After you download one of the files (above) to a directory on your own computer, double click on the file name. (For example, you might double click on ab7pro14.exe.) A small dialog box will appear with the message: "Ready to Install AnyBook. "To start the installation program, click on "Unzip" button. The files will be unzipped and the main installation program will start, and it's just a matter of following the directions on the screen. A complete help system accompanies AnyBook. You'll find a "Getting Started" section under the Help Menu. Additionally, you find enclosed sample invoices, customers and products that will be helpful as you evaluate the program. First, there's no cost to download the software and evaluate it. You're under no time limits. Try it out at your leisure. If, after trying it out, you find that AnyBook will do the job, we ask that you register the software. Registration costs are found below. Special Pricing! We are offering AnyBook at huge discount off the regular price with the understanding that no support is provided. The discounted prices are shown in red (below). Levels 5 - 7 include the Rover Module, a separate standing, portable form of AnyBook that can be taken on the road or used by sales personnel, or for divisional sales, international sales, storage of old invoice, mailing lists, or for a variety of other purposes. All data files are compatible. You can move from one program to next as your business grows. The cost to upgrade from one to another is the difference in price plus $9. For example, if you start out by registering Level 3, and then at a later time you wish to upgrade to Level 4, the cost is only $10 + $9 = $19 (not $39.50). What the Experts are Saying . . .
Diane Tinney is a CPA, the author of several computer books and the owner of a publishing company. She extensively reviewed AnyBook for Independent Book Publishers Association (formerly PMA) journal. Here are some highlights of the 5-page review. "Having a degree in accounting, having passed the CPA exam, and having spent decades in the accounting and tax profession, I knew that finding the right accounting system for our new publishing company was paramount. "I continued my search, downloading test versions of several accounting systems for publishers. All seemed to do what we needed, but in one way or another, they fell short of my expectations. Then, searching the web one night at home, I found the best little gem in small press publishing: AnyBook! "The first thing that impressed us about this system is how intuitive it is. Reminded me of the first copy of Quicken that I received--easy to use, powerful, and yet advance features don't get in the way of a novice just trying to get work done. "Knowledge is power and as publishers we are often so focused on the facts and ideas in the books we publish that we forget to take the same care for ourselves in back office tasks such as accounting and financial planning. A system such as AnyBook can help you get a handle on your core accounting functions. Working hand-in-hand with a more traditional general ledger accounting system such as QuickBooks, you can have the best of both worlds for a reasonable investment of your time and money." PC Magazine, one of the computer world's most respected informational sources and known for its demanding and thorough software reviews, has awarded AnyBook an Editor's Pick Award. *Since this review was written, we have added dozens of new features including email support, reporting enhancements, and export/import capabilities. In the Professional Edition you can export invoice and sales data to spreadsheet, database, or accounting programs. You can also export the entire invoice or statement for use in word processing or email programs. The Advanced Edition has an even more comprehensive export feature along with newly added import functions. Software Seeker presented AnyBook with an Editor's Choice Award. Along with the award, we received this note . . .
"I have looked over your software application, AnyBook and I want to tell you that I am very impressed with it. AnyBook is an outstanding application that deserves praise and recognition." Simply the Best Software Selects AnyBook! 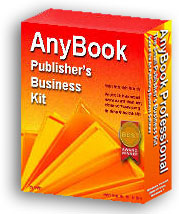 AnyBook receives high marks from publishing business consultants. Kensai International, an operations and management consulting company for publishers, says that "We believe that the best software solutions are those that are frequently updated with new functionality. This demonstrates a software developer's commitment to the product and their clients." And that's exactly what they like about AnyBook: "We like AnyBook for its amazing feature set, frequent updates and low price." AnyBook! is ranked in the top 100 Business & Accounting Software programs by Softbase, a software ranking and informational site. Its ranking places AnyBook among some good company. Included on the list are such well-known products are Quick Books, Peach Tree Accounting, Quicken, etc. AnyBook is also the only publishing business software program currently recommended by The Small Press Resource. Publishing business and book sales require fast operation, well-designed processes and quick reaction to customers’ requests. This is a dynamic and highly competitive environment where efficiency of daily operations is the primary determinant of your success. All this requires a set of tools that will help you track and manage your inventory, ship orders and process returns — and that’s exactly what AnyBook has to offer! 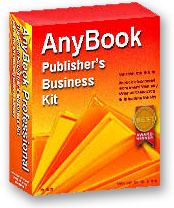 AnyBook is a popular multi-functional suite that solves all kinds of problems related to publishing: from inventory management to royalty fees, from invoicing to credit card processing — shortly put, this is an all-in-one solution that will take care of every aspect of your publishing and book distribution business, no matter if you are a startup or an established company with hundreds of titles on your list. Offered in 6 different variants (Levels I — VI), AnyBook allows you to get just the functions you need at the moment and upgrade to a more complex system when needed. Therefore, you only get what you really want and need now for your money — no unnecessary extras are added! The interface of the program is easy and intuitive, so you don’t have to be an PhD to get the job done. The program can be bundled with a Rover module, which is intended for managers who are always on the go and allows you to use the application wherever you go! Anyone, anywhere, any problem solved — this is what AnyBook is about. Check the official site for an astonishing list of features, customers’ testimonials and pricing details. Don’t lose time and make your business as efficient as you always wanted! "I love Anybook software. My whole publishing business is just a few keystrokes away -- authors, customers, titles, billing, royalties -- all organized in a fraction of the amount of time it would take without Anybook. " "Anybook is the perfect answer to a small publisher's inventory tracking needs. The well-designed program is every bit as functional as the big commercial systems...at a fraction of the price. And the customer service is exceptional!" "This shareware program is the most powerful tool I've found for small publishers. It keeps track of customers, orders, payments and everything else a small publisher needs." AnyBook is very user-friendly and easy to navigate around. It is reasonably priced for the small publisher and definitely provides all the reports and information needed to run your business efficiently. They have wonderful customer service, are extremely helpful, and are always willing to walk you through any problems, questions, or concerns you may have. "Thank you for such a wonderful product at a reasonable price. It's the only one I found that does everything I need it to that is truly built for the royalty paying publisher. Several of my books have multiple royalty payees and this program is built for that possibility. I started in the publishing business the summer of 1999 and started looking for accounting software that I could afford that would accommodate our company's growth. Once I tried out AnyBook, I knew I had found the right software." "We find Anybook exactly fits our needs as a small publishing business. It is an exceptionally user-friendly program. The Help content is comprehensive and for the self-publisher with little or no business background a God-send as it not only explains what to do but why one is doing it. The latest upgrade with its enhanced export facilities has enabled us to send orders directly to our fulfillment warehouse and for us, based as we are outside the US the currency conversion feature is a big plus. Furthermore the support available on registering is unbeatable. Using Anybook has made a very big difference to us. Thank you very much indeed!" "It is sales tax time here in California €šand what an an easy job it is with your program. I just print it out and enter the numbers. I am so grateful that you have put this program together. Publishers like myself are very fortunate." "We recently received a gift of 65,000 pieces of artwork. Other software management solutions were very costly. AnyBook not only solved the problem, the support staff were more than helpful in adapting the product to our specific need. Simply stated . . . a perfect software solution at very reasonable price." John Kremer's Book Marketing Web Site. John Kremer is one of the book industry's top marketing advisers, and is well known for his best-selling book, 1001 Ways to Market Your Books, an invaluable reference work for small publishers. John's web site is loaded with publishing links and information on book marketing and book promotion.